Video has emerged of the dramatic scenes of a bridge collapse on the Great Walk Lake Waikaremoana in New Zealand, in which 4 French tourists plunged into the river below. 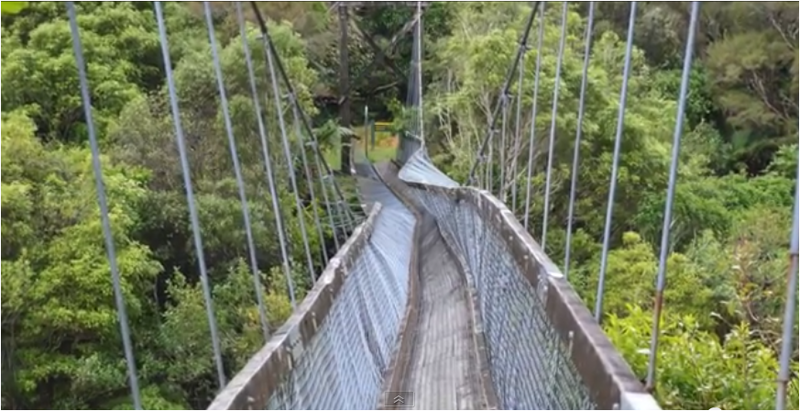 The uploader said the bridge was rated for 10 people yet the cable snapped with only four people on the bridge. Scene from the video taken immediately after the bridge collapsed. Note what appears to be rust on the right hand side of the frame. The following article particularly want my heart. After meeting Roland Adrien and every four we decide to make a four-day walk around Lake Waikaremoana. The hike goes well, now we come to the end of 46km. We have one last suspension bridge to cross. The panel shows a maximum of 10 people. Arrived halfway we hear a thud and before you have time to anything that’s thrown me into the empty fatally accepting what follows. One of the two cables has laché. After the impact with the water absorbed slowly I start up, I see that I have nothing broken and look around to search everyone. I see standing Enzo, that’s a relief. Adrien then I see a little further, as we all astounded. No Roland. I look up, it is still on the bridge, I do not know by what miracle, I see it climb slowly to the other side of the earth. The boys and I decided to quickly cross the river to the risk that the other cable loose and that the remains of the bridge joining us below. We have water up to the top of the knees. In shock I return to my senses and climb the hill to finally arrive at Roland. After this accident follows a series of meetings. The DOC (Department Of Conversation) took our statements. Two members of the Tuhoe tribe council explain the complex history of this land. They also tell us that we fell to 8.5m high. The Tuhoe Maori have as many experienced colonization and wars. But also the confiscation of their land. The government has later admitted liability and made part of the land to the tribe. In recent years an amendment was voted for land management lies with Tuhoe to respect their culture and traditions. The latter entered into force only a year ago. Since then the DOC institution working under the supervision of the Board of Tuhoe. The national park has no owner, it belongs to himself, which is unique. Several questions arise. Faced with this “sharing” of responsibilities, Tuhoe want to accompany us in every step: we start in the big neighboring city in Napier where we spend a few days time everyone consults a doctor, rests, etc. I want to remind that no one was injured. Unlike the DOC which to date has been of no help. In our testimony we ask several questions about the equipment maintenance procedure, no response is given, we will learn later through newspapers answers to our questions. This information had to be shared fairly. Not only informative and preventive but also to expose the entity that is the DOC (belonging to the Ministry of Environment). I will keep you informed following the next items that will be given to us. Indeed several investigations are conducted simultaneously by different entities to determine the cause of the accident. I would strongly advise any walker anywhere in the world never to underestimate the risk for obstacle clearance. Remember to pass one by one on all types of equipment and not to play on structures that may be far more fragile than what they owe. Here is a photo of the bridge in question after the accident and three links of articles (both the New Zealand Herald on two different dates and the press release made by the Tuhoe tribe). Read a very interesting discussion about the accident here at New Zealand Tramper about the way in which the information stream was controlled by DOC; and “formalised media releases” rather than investigative journalism. 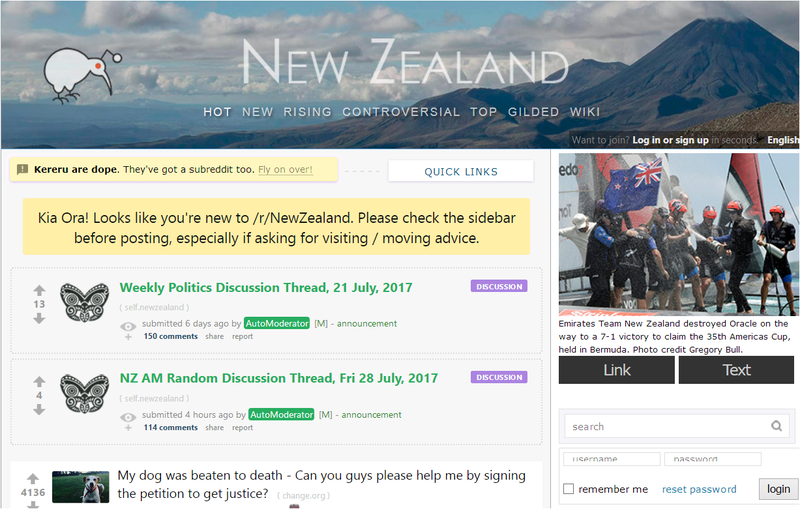 We originally wrote about the collapse on 7 Sept: “New Zealand’s Reputation “Vulnerable” after Lake Waikaremoana Bridge Collapses, 4 French Tourists Injured” and its similarities with the fatal Cave Creek Disaster, when a scenic viewing platform in the Paparoa National Park failed, resulting in the deaths of 14 people. Chris Jordan also worked with other bereaved families to get New Zealand to adopt higher safety standards . To us this looks like yet another adventure tourism fail. Fortunately on this occasion no-one was killed or seriously injured, it is however a reminder that you take your life in your hands when vacationing in New Zealand. Emergency services were called to McLaren Falls, south-west of Tauranga, this afternoon after a call from the public to say a person had got into difficulty after falling from a rope swing into the lake, SunLive reported. A spokesman for the Trustpower TECT Rescue helicopter said: “The man was swinging on a rope swing when the rope snapped, he fell into the lake, his friend jumped in to help and both men got into difficulties. Hello all. Long time reader, first time poster. A few years ago DOCs operating budget was slashed by 1/3 to $100 million by the Tourism Minister. To be honest even the original amount fell way short of what is needed to cover all the responsibilities DOC has – from maintaining tracks and bridges, to native flora and fauna conservation. The bridge incident should not come as a surprise – DOC is now just another underfunded and understaffed organization. People not familiar with the tourism industry should know that there are numerous concession programmes in place that aim to boost DOCs operating budget, however this is absolutely not working in its’ main aspects. In general, tour operators are required to have a concession for parking vehicles in DOC car parks, and a separate guiding concession for taking paying tourists on walks. There are separate and location specific concessions for operators offering repeat activities in one location only, but this is beyond the scope of this post. The above mentioned concessions for vehicles and guiding have not as a matter of fact even covered the administration costs of running the system, in other words it is a bureaucratic elephant, and many operators/guides who have signed on to these concession systems see them as nothing more than an honesty tax on people who want to do everything by the book, while others just ignore them – maybe these are the smarter ones? The tourism industry has an unknown “Uber” problem… in short you need a New Zealand drivers licence and relevant passenger (P) and weight (Class 2, 3, 4, 5) endorsements to carry tourists from overseas in organised tours. You need to be a New Zealand company to sign into the DOC concession system. A few years ago the Tourism Minister was made aware of an ongoing problem of overseas tour companies sending tour escorts that accompany overseas tour groups (usually without the required limited purpose work visa). They rent people movers (often straight after the long haul flight), and drive tourists around – up to 10 tourists they rent one 12 seater, if the group is up to 20 people they send 2 tour escorts and rent 2 12 seaters (or a larger Merc Sprinter or VW crafter which miraculously falls under class 1 weight limit – so no problem to rent on an international licence). From the money side this comes out much cheaper than chartering a bus with a local driver, so lets call it clever business. Neither the foreign company, nor the overseas drivers can actually obtain what is required unless they register in New Zealand, and the drivers convert their licences into New Zealand ones and obtain the needed endorsements. The risks of being caught are abysmally small – rental companies both big and small live off of this (otherwise the number of rental people movers would halve me thinks), therefore locals (especially those catering for niche languages), not only have a competitive disadvantage of additional costs and needing to be licensed and sign up for DOC concessions, but also they have absolutely no support from government. To lodge a complaint with NZIS you need to know the perpetrators full name and date of birth – how are you supposed to find this out? – the rental company won’t tell you. You might say call the Police – fine, if you are in the right place at the right time maybe something can happen, but in general the Police will not do anything unless immigration becomes involved – a total paradox, or at least a WTF kind of situation. 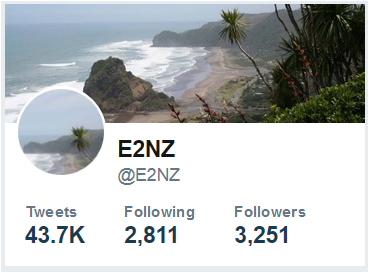 By the time the NZTA does anything, its days later, and remember these tours cover hundreds of KMs per day, so chances are the group and illegal driver are 2000km down the road, or out of the country before anything is done, so case closed. The Tourism Minister’s response to all of the above was that it is not a big deal. To be honest in some markets like mine, something like 80% of tours do something illegal as above so yeah not a big deal. My endorsements and concessions do nothing more than increase my prices, making me uncompetitive. Thinking like a banker the situation is genius – it’s all about the visitor numbers increasing year on year – we don’t want to scare off tourists now do we, so let’s just turn a blind eye to the foreigners doing it all under the table and she’ll be right – at least we are getting money from the legal ones. To rub salt into the wound, a few years back a proposal was made about a border tax, to be paid by all arriving tourists to help with conservation activities and to partly fund DOC ($25 x 2million arrivals annually = $50milliion = DOC’s slashed 1/3). It was completely ignored by the Tourism Minister, but surprise, surprise, look at the budget from this year – now there WILL be a border tax, but the funds will go to border security, and DOC will get absolutely nothing. Gotta love all this crony BS. I wonder if Worksafe NZ shut the scene down and is investigating issuing massive fInes to DOC management. As they would do to a small business .